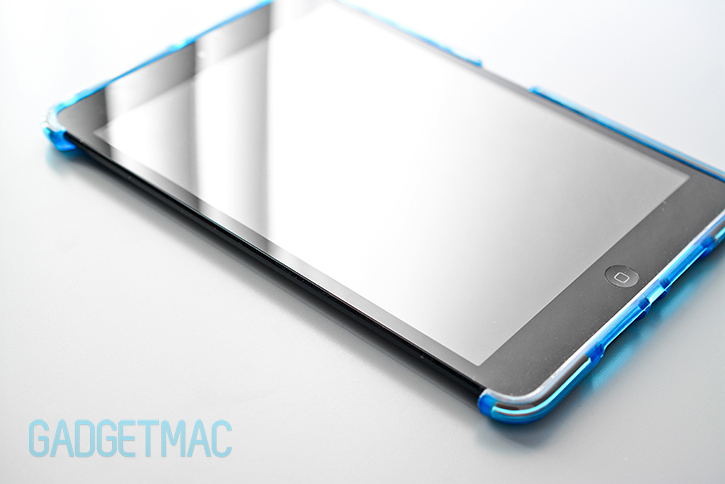 How do you make a really slim case really protective? With an orange colored material called D3O. And Tech21 is a company known for incorporating this material into its protective cases, more notably the Impact Band for the iPhone, as an impact-protection agent which hardens on impact in order to absorb and disperse shock away from the encased device. One of these cases is the new Impact Mesh case for the iPad mini, a seemingly simplistic slim TPU case that's more drop protective than any ordinary slim TPU style case. 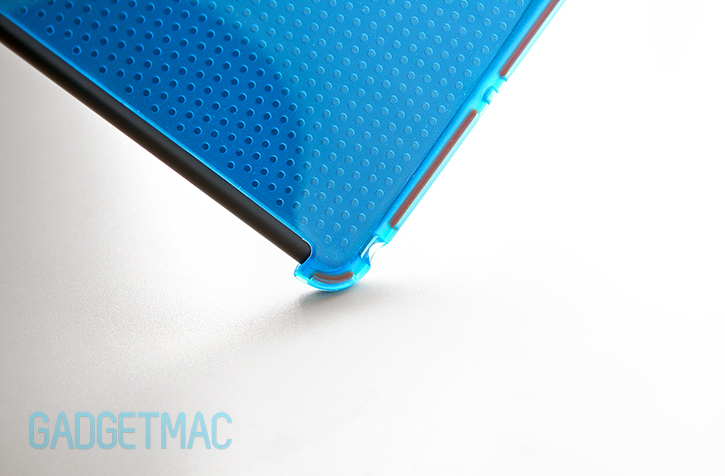 And as you can tell straight away, the Impact Mesh case is also Smart Cover-compatible. As cool as Tech21's D3O might sound, is it really worth spending $40 on? Let's find out. When you first take it out of its box-like package, the Impact Mesh is really no different than an ordinary semi-flexible TPU case. It also installed on the iPad mini in a similar fashion meaning there's little effort required during the insertion process. Okay that sounded a bit difficult, but really there's nothing to it. Once the case is on, it fits for the most part tightly around and looks really great on both the black and silver iPad mini. 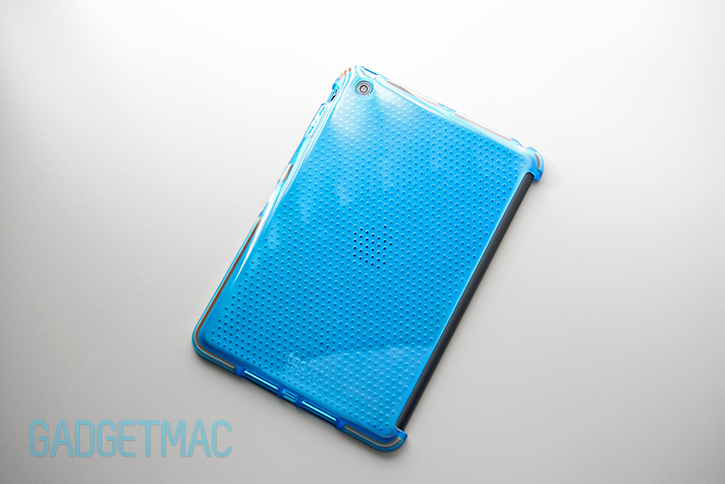 The "mesh" texture around the back of the Impact Mesh case creates this perforated-like pattern you can see the Apple logo and some of the iPad mini's original color through due to the semi-translucent color of the case in conjunction with the matte and see-through textured pattern. 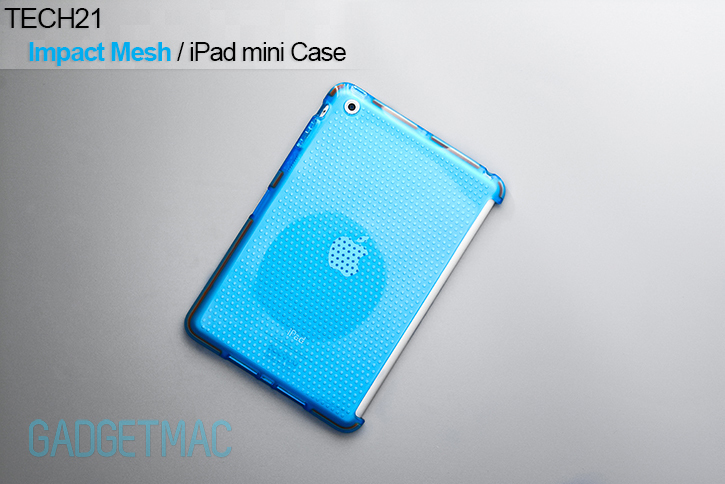 Made from an unforgiving TPU material that's harder and tougher than other TPU-made cases primarily around the edges which are supposedly meant to be reinforced for added protection, the Impact Mesh is just another slim iPad mini case that albeit features pleasing refinements and no unnecessary bulk. 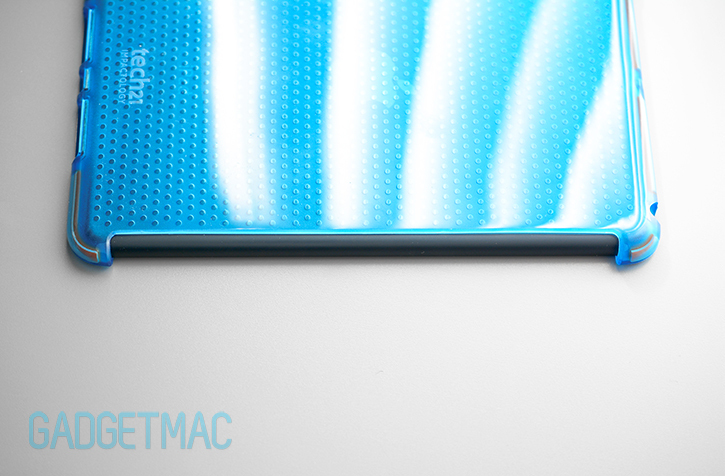 The case itself is entirely smooth and slick to the touch despite looking as if its mesh pattern was actually a raised texture on surface which it isn't. Instead, the Impact Mesh has a glossy finish all around its exterior offering little to no additional tactile grip which is understandable when it comes to these shiny TPU-made cases. Parts of the Impact Mesh case look like delicious candy with the orange colored D3O elements embedded into its shiny translucent TPU material. 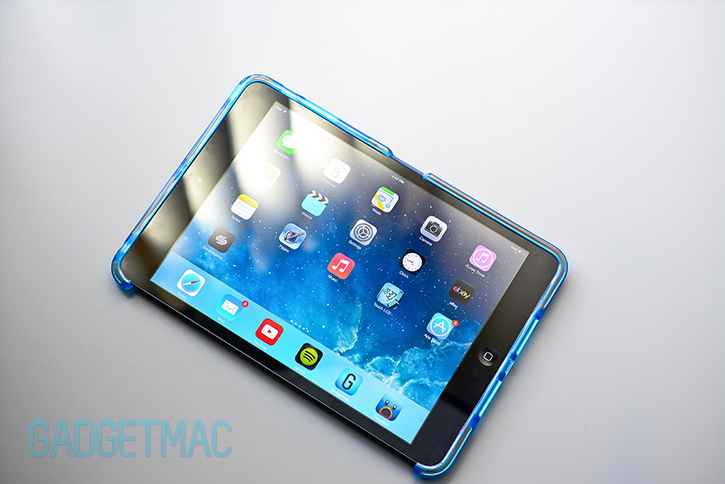 Tech21's Impact Mesh for the iPad mini comes in a few different translucent color combinations including this blue one we've got here, pink, smoke and clear that best accentuates the infused bright orange colored D3O elements. 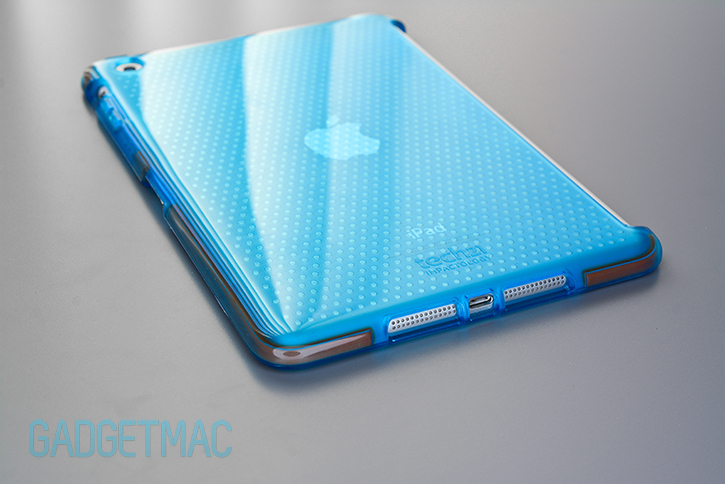 Naturally there's also an iPhone 5/S and iPad 2/3/4 variant of the Impact Mesh case. Obviously with such reinforced corner and periphery protection featuring this special embedded D3O material, the Impact Mesh case offers some of the best drop and impact protection you can get with such a slim case. In addition to the D3O layer, the Impact Mesh's periphery is extra thick compared to its back layer which by comparison really isn't going to do much if you drop your iPad directly flat on its back side, although that literally never happens anyway. 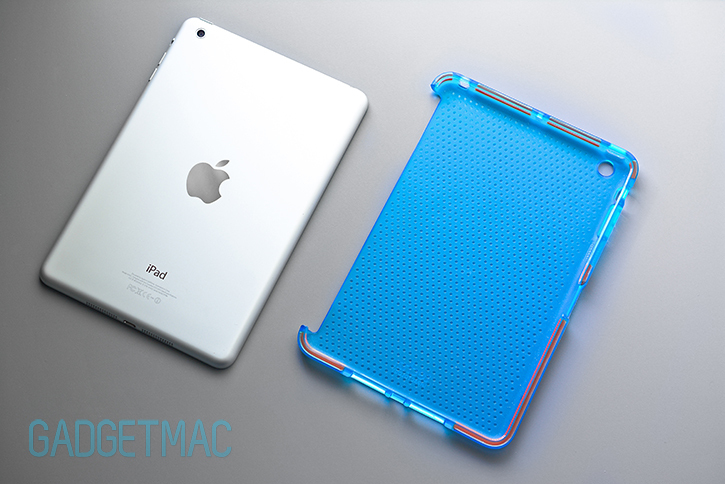 This means that the most crucial points of impact in the event of a drop are thoroughly protected by the Impact Mesh's reinforced construction unlike most regular slim TPU cases, while enabling it to have a very slim form factor that you can appreciate as you hold your iPad mini. 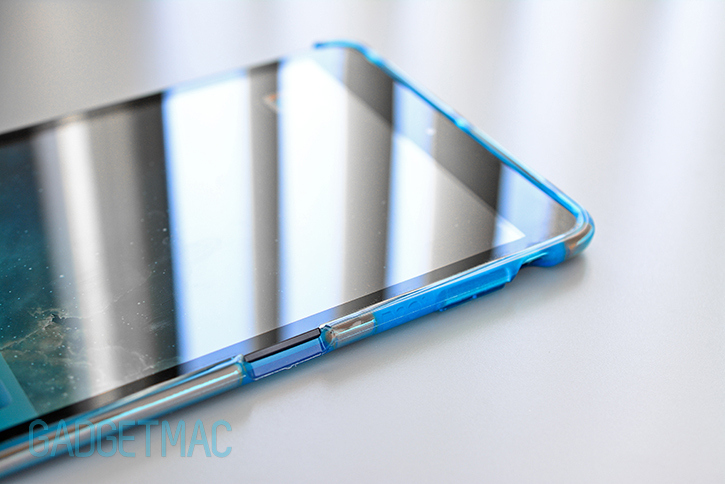 This D3O-infused edge surrounding the iPad mini's bezel is rounded like a translucent pipe to give you better, more comfortable grip support when holding the device while also providing a good amount of lay-on-the-table design that helps keep the screen elevated and away from contacting the surface when dropped or laid flat on top of a table. But as you'll come to see, the same cannot be said when holding the iPad mini with your left hand. 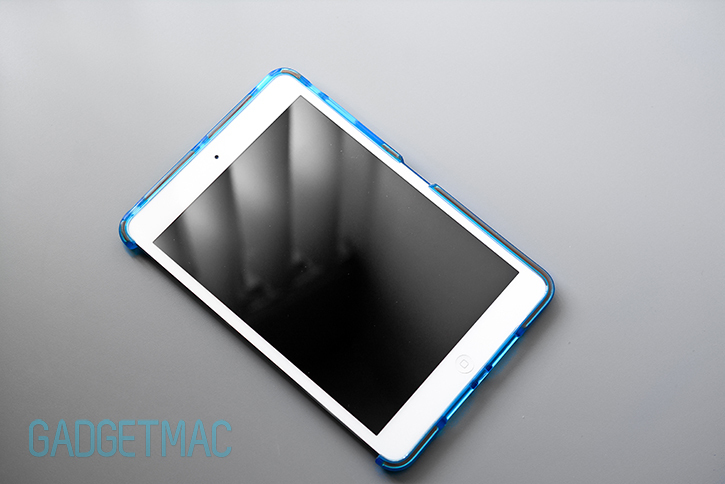 Being that the Impact Mesh case is Smart Cover-compatible, you'll notice that one side of it is missing and that's because the left side of the Impact Mesh features an extended cutout opening designed to enable a Smart Cover to be attached to the iPad mini. While it's most definitely a welcome addition mostly to people who actually own and use Apple's pricy Smart Cover accessory, it's otherwise a caveat to others. First, there's a subtle play around the opening where the Impact Mesh's back layer does not sit flush against the back of the iPad mini as it should - which causes the left side part of the case to feel like it isn't sitting completely snug against the iPad. Although it's a tiny nuisance, it isn't what I expect to find on a $40 case. This would have otherwise been perfectly fine on a hardshell type of case like SwitchEasy's $20 CoverBuddy shell where all the right tight tolerances fit together to form a perfect form-fitting fit with no lose ends unlike these TPU cases. If you're just using the case as you would normally without a Smart Cover attached, the feeling of such a wide opening is frustrating. Not only is it asymmetrical, but it also leaves room for potential damage to the iPad mini's chamfered edge and even parts of the aluminum. Although to be fair the Impact Mesh does a fairly nice job at ensuring all four corners are amply protecting as if they has bumpers added on. A straight horizontal impact on its side will most likely not cause damaged to the iPad mini's exposed side edge thanks to the reinforced corners, however, there's still plenty of room for things to go wrong if no Smart Cover is attached as intended. Nonetheless, using the iPad mini with a Smart Cover attached and flipped around the back feels really great and not bulky at all. 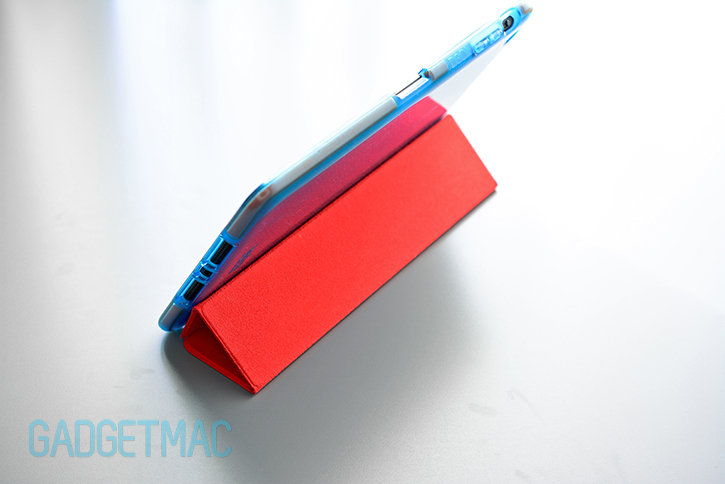 As expected the Smart Cover can fold back freely into its landscape stand with the Impact Mesh case installed uninterrupted by the slender thickness of the case. We were pleasantly surprised to find Tech21's small attention to detail in the form of a finger notch located on the right side of the case where it provides the user ample space to effortlessly lift the otherwise flush lid of the Smart Cover. Buttons are covered by the case, and except for the volume buttons which aren't the easiest to push through the slightly rigid material, the sleep/wake button is easy to press while a generous cutout made for the silent/rotate switch makes accessing it very easy. 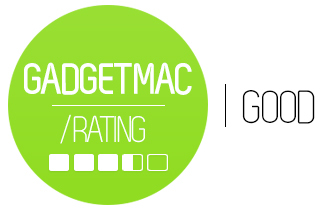 Cutouts for the top mic and headphone port were also done well enabling you to plug in L-shaped 3.5mm jacks. Taking a look at the bottom openings for the iPad mini's stereo speakers and Lightning connector port, we can see three individual cutouts that are slightly off-centered. Surprisingly I was able to fit Apple's micro-USB to Lightning connector adapter into the tight cutouts as the material expanded out of the way just enough for the adapter to make the proper connection with the iPad mini's Lightning port so no trouble here. 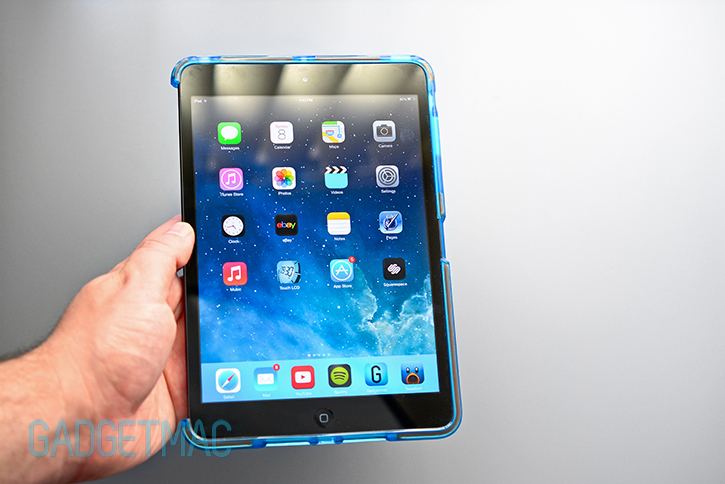 Overall we're left unimpressed yet not disappointed in the Impact Mesh case for the iPad mini. Even though it features D3O, a feature that is understandably exclusive to Tech21, the Impact Mesh is still considered to be on the pricy side for what it's worth. 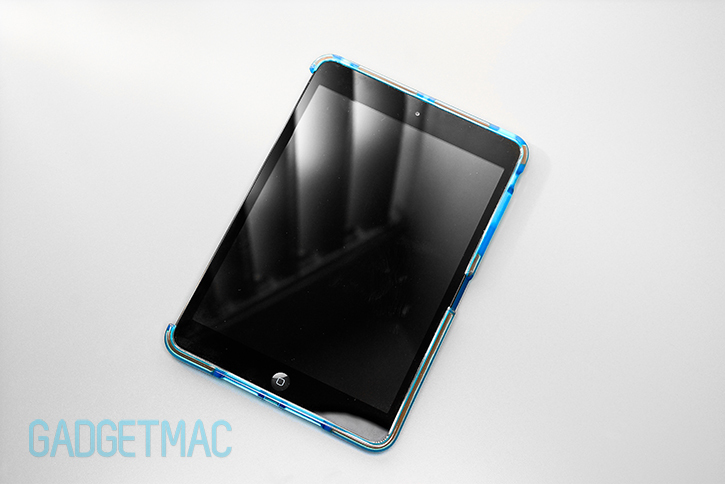 As a slim iPad mini case with Smart Cover friendliness and undeniable reinforced impact protection, we think the Impact Mesh is unique and good enough to merit your consideration. 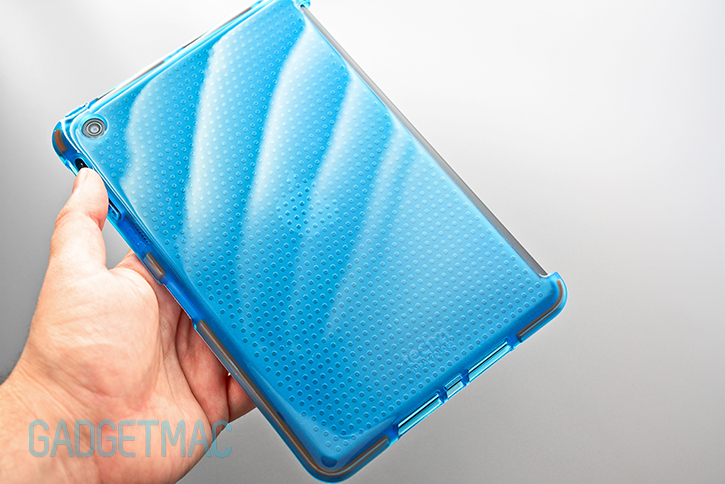 However, if you aren't going to use a Smart Cover with this case, we don't think you should spring for it as it really just feels unfinished and exposed without a Smart Cover attached. 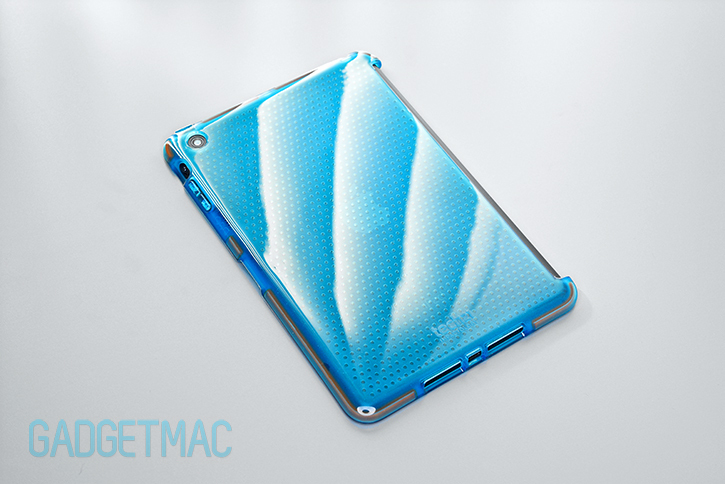 We don't think a lot of iPad mini users use a Smart Cover with their cases, and thus we think Tech21 should have at least released a standard version of the Impact Mesh with a fully enclosed perimeter that would also make it more form-fitting and more pleasing to use.